Located in Meenacurrin townland. 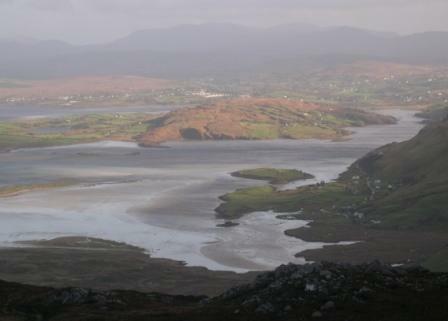 Slievetooey is on the north side of the peninsula, while Slieve League is on the south. The cliffs and stacks along Slievetoey’s seaward side form one of the most spectacular stretches of coastal scenery in Ireland. The highest point at 511m is actually unnamed on the Discovery map, while the name is positioned on a lower peak (472m). There are many possible interpretations of the specific element in this name. O'Neill mentions tuagh, an axe or hook, and tuathach, a lord or ruler of a tuath. If the early forms can be relied open, there appears to have been an article between the two elements, which would make north mountain rather unlikely. Previously Meenacurrin in MV. 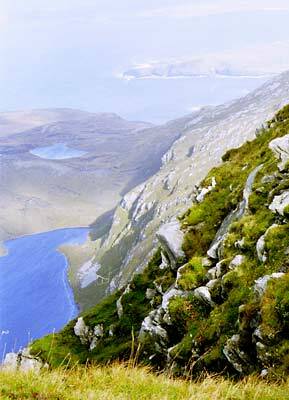 Sliabh Tuaidh is the third highest mountain in the Donegal SW area and the 526th highest in Ireland. Several possible approaches. The first is to park at carpark near Maghera beach G662907 A and head directly west onto open slope, passing an old ringfort and the small Lough Acruppan, where you turn WWS, ascending a gentle slope for 2km, taking you to the summit, incorrectly identified on OSI map as Meenacurrin (the map also incorrectly places Slievetooey 2km further west, in the middle of a broad plateau). The total time to top, 2.5 hours. A simpler approach may be taken from the SE. Park at the layby G641 891 B (parking for 3 cars). Head up the hillside to the west for a couple of hundred metres, initially steep, then easing, (a couple of fences to cross). Then turn directly north. The terrain rises gently, is pretty firm, short grass with patches of heather, and as you near the summit becoming more rock-strewn. This approach takes just over one hour. A similar approach is to park in the same spot, but walk a few hundred yards along the road to the paved lane at G639 887 C. This roadway is marked with official 'walker direction poles', so one assumes it is ok to use. The paved bit ends after a few modern farm buildings and becomes a stony track, crossing a stream. From anywhere here you can access the open hillside, where you should simply head directly north towards the summit. This walk is based upon route 34 in David Hermans Hill walkers Donegal. I used the same ample carpark (662907 A) as Paul, which was deserted in November. I followed the narrow road out of the village and climbed the open hill after the last building. Height is gained quickly following the zig zags of ground terraced by sheep, with views N to Errigal and S Snaght. Pass an old ringfort or such and pick up a fenceline to the R, a discerable track is then followed as it climbs above the pounding surf in Lougros Beg Bay. I had stunning views on a bright day with blue skies (while inland was shrouded in heavy fog) which gave a vista over the headlands and bays to Roaninish Island some 11 km away. I followed the ubiquitous blue water pipe/stream uphill and inland as it snaked its way from Lough Acruppan. The lough shore (646908 D) was reached in 1 hour, I stopped for a bite to eat and skirted its edge to make for the higher ground to the S. Pass 2 small cairns and head SW for the top (seems to have been some cairn building contest) with magnificent views on the way, reached in 2.25 hours. From the top there were views to S League, Sligo Hills, (and possibly the Iron Mtns rising above the mist of Donegal Bay)Cuilcaigh and to the Bluestacks and Derryveaghs, along with all the stuff along the coast. The trig pillar is a little further to the W, with a fence protecting the steep drop towards L Croaghballaghdown and little L Beg. Views further along the coast to the W brought Sturral Head and the signal tower above Glencolumbkille. Continue W and drop down into a col before the short climb up to point 472 (Slievetooey). Walk across level ground before a big drop down to the NW towards the river flowing from Adoochro - i only got a brief glimpse of the waters of this classic corrie lough. Cross the river before it starts really cutting into the hill with an impressive ravine. The smell of salt and sound of waves assault the senses before arriving at the stunning sight of Gull Island (613924 E). It is now a case of following the coastline back, below the hills that have just been traversed. Unfortunately for me light was fast fading and i lost the not too recognisable track, leading to me scrambling up some very steep ground in the dark with the sea far below. This was tough and it took me some time to regain the track which eventually brought me back the way i had started. I arrived back at the car very tired but happy at a cracking day. 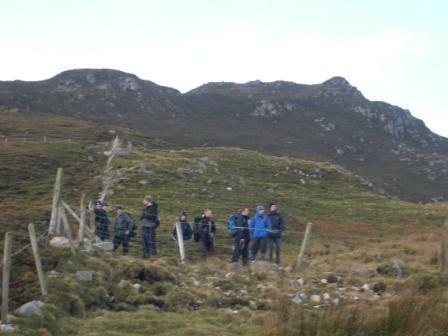 A 10-strong group from QUBMC climbed Slievetooey on a breezy Sunday in November. As time was limited, we took one of the shortest routes available, approaching from Maghera Strand on the NE side. The views were fine, except during a couple of squally showers. The views took in Loughros Beg Bay, the Loughros peninsula, Aranmore and the vicinity of Ardara. From the summit we could also see Errigal and neighbours and the Blue Stacks. The surf in the bay below us was very impressive. We later found out that the huge swell and sea-spray prevented other members of our club from getting any climbing, both at Muckros Head and at Malin Beg. Bring the surfboards next time lads! From Maghera access to the mountain is straightforward. There is a car park beside a small group of houses. Signs on a cabin indicate that there is a fee for parking, but it seems that money is only collected in the summer season. Tracks bring you to a height of around 150m. When you cross the top fence and enter open ground, you can follow a track climbing gradually beside a blue plastic water pipe for a few hundred yards, before heading off to the left (south). After this there are only faint sheep tracks until you approach the summit. However the way is fairly clear if visibility is good. The ground is somewhat heathery, but the growth is not too high. HC Hart [Climbing in the British Isles, 1895] describes a walk starting from Maghera, a sandy beach, to the right of this picture (east). “Following the coast, there is a track near the water’s margin for some distance. Soon the precipices forming the north face of Slieve-a-tooey are reached. If the tide is low the base can be followed a long way with one or two ugly corners.” He mentions that the height of Slieve-a-tooey is 1692 ft which is around 514m. This is interesting because on the modern 1:50k map Slievetooey is shown as 472m while Meenacurrin, to its east, is 511m. So it seems that formerly Meenacurrin was regarded as part of Slievetooey. This is near the summit of Meenacurrin, looking east towards some of the lower mountains such as Croaghataggart (344m) which line the southern side of Maghera Strand.